Two countries that rise to the top in any conversation about Latin America are Colombia and Chile. They both get high marks for their property markets, economic performance, lifestyles, and geographic diversity. Colombia and Chile share some common ground, but they’re different in many ways. Let’s compare these top two destinations head-to-head. The property markets are solid in both Chile and Colombia, and in general, a quality rental property will generate about the same return in the same type of neighborhood. The exception is Medellín, Colombia. I tried comparing Medellín (El Poblado sector) to Chile’s capital Santiago (Las Condes sector), but it didn’t work because Medellín’s properties are so under-valued. Comparing Bogotá to Santiago is a truer comparison, and you’ll find costs are fairly even. Bogotá’s rentals cost about 15% less than Santiago’s…while buying an apartment in Bogotá will cost you about 11% more. The lifestyle options are more varied in Chile than in Colombia, although both countries offer mountain, coastal, small-town, and upscale big-city living. Chile’s coast however, extends through thousands of miles and a number of different climates, so it offers far more lifestyle and property options than Colombia’s coastline. The Chilean coast is more expensive than the Colombian Caribbean, except that Chile’s Viña del Mar compares to Colombia’s Cartagena, price-wise. I personally find Viña del Mar better for full-time living—it has a full-service city seven blocks back from the beach—and Cartagena a better place to invest in real estate or manage a rental property. 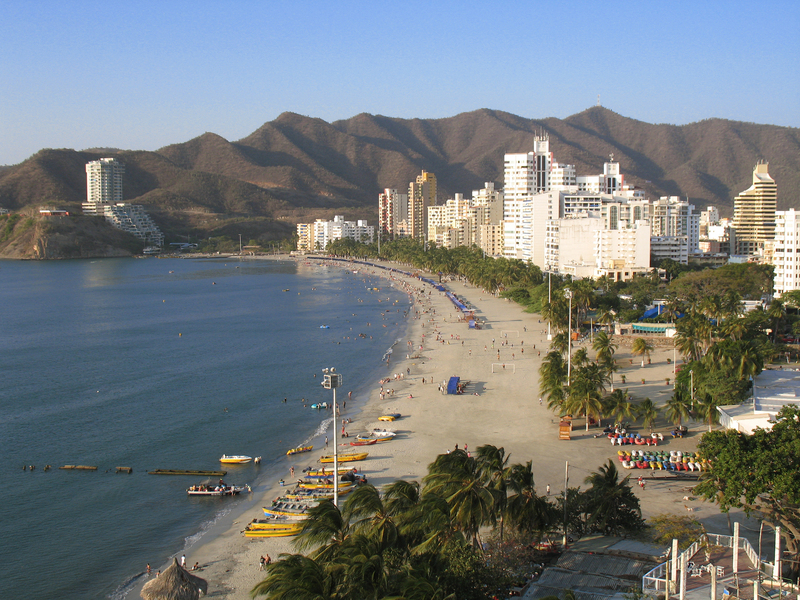 Colombia’s Santa Marta is a good choice for seaside Caribbean living. It’s much cheaper than either Viña del Mar or Cartagena. And in Chile, don’t overlook La Serena, which is actually my first choice for coastal living there. Both countries offer dramatic Andean scenery and lifestyle options. But Chile’s Lake District—with its wildlife, lakes, four seasons, and skiing—is hard to beat. What you won’t find, are classic, Spanish-colonial cities like Colombia’s Popayán. For big-city living, I don’t think you’ll beat Colombia’s Medellín…although Santiago’s Las Condes offers a similar lifestyle (with a somewhat-larger pricetag). Residency is easy and straightforward in both countries, with minimal amounts of red tape involved. Colombia’s efficiency is hard to beat—I got my Colombian residency visa in less than one hour—but both countries rank high in this area. although Colombia’s middle class is currently expanding at a faster rate. Infrastructure is good in both countries, and you’ll find reliable broadband Internet service, drinkable water, and reliable electric, telephone, and cell service. But Chile enjoys a better infrastructure overall—including in far-flung areas—when considering the country as a whole. Geographic diversity is good in both countries, and which you prefer will be a matter of personal preference. Colombia is near the equator, so there’s little seasonal temperature variation. It offers relatively cool mountain living, a Caribbean and Pacific coast, and a good selection of colonial cities in both the mountains and on the coast. Colombia also borders on the Amazon rainforest, which makes for some excellent travel opportunities if you live there. Chile has four seasons, much like an inverted California. It also offers mountain living with forests, lakes, wildlife, and even snow and skiing in the more southern zones. The Chilean coast is 2,650 miles and offers a much wider range of towns, lifestyles, and property markets. The coast is dramatic and beautiful, but there’s winter season, the water’s almost always cold, and it can be windy (or foggy) at times. The northern Chilean coast is home to the world’s driest desert, the Atacama Desert, which gets 4 inches of rain every 1,000 years, and one of the wettest cities, Valdivia, which gets about 98 inches of rain per year—more than twice that of Seattle. The culture of Colombia has a Spanish-American flavor in most of the country, outside the big cities. In Chile, you’ll find a mostly Spanish influence in the north, and a strong German influence in the south, where you’ll even see bilingual (Spanish-German) signs and Bavarian architecture. But—at the risk of using ethnic stereotypes—the whole country runs with German-style efficiency when compared to the rest of Latin America. And northern architecture aside, none of it feels like it was ever a Spanish colony. As to the Third World Factor, Colombia feels like a developing country aside from a few notable exceptions (like Medellín’s El Poblado or Bogotá’s northern districts). Chile feels like California—until you get down to Puerto Montt and Chiloé, which feel more like Gloucester, Massachusetts. Both countries are working hard to encourage foreign investment, but Chile’s doing a better job of it. Their Startup Chile program is a huge success, attracting entrepreneurs from all over the world. And it’s just one of three new programs that offer residency. Follow the link for an interesting article on the Startup Chile program. Colombia’s foreign direct investment is going up dramatically. But moving money is inconvenient and inflexible thanks to their capital controls, and this will continue to hamper FDI. Wine lovers will be happier in Chile, where you can get top-quality wines at reasonable prices. We have Chilean wines in Colombia too, but they come with a hefty import duty, as do all Colombian wine imports. Access to the United States is far easier from Colombia, with a number of international airports offering nonstop service. Miami is about three hours away. From Chile, the flight from Santiago to Miami will take almost nine hours. The cost of living, generally speaking, is higher in Chile than in Colombia. Depending on what you spend your money on, you’ll spend about 20% to 30% more in Santiago’s Las Condes district than you’d spend in Medellín’s El Poblado. Interestingly, for those earning in the local economy, your purchasing power is 54% higher in Santiago than in Medellín or Bogotá. Nationwide, Chileans enjoy a 68% higher purchasing power than Colombians because the higher wages in Chile more than offset the increased cost of living. In fact, average wages nationwide are almost 92% higher in Chile. This increased purchasing power makes no difference if you’re receiving a pension from outside Chile, but if you’re a salaried worker or entrepreneur, then Chile holds the edge. The choice of Colombia or Chile will largely be one of personal preferences. Both countries offer advantages depending on what you’re looking for. To generalize, I like Colombia best for retirees, second homeowners, and those who are looking for a richer cultural experience. I like Chile better overall for doing business, and for those who want a true, First-World environment with four seasons. But both countries are truly top-rate choices now. I am planning on moving in the next two years, and so far I have been to Quito and Manta, Ecuador. I have a friend living in Salinas, Ecuador, and am going to go there next year for a visit. My first choice is Manta, but what I have found so far is that the prices on properties are being inflated by all the Americans over there. I want to buy a 2–3 bedroom condo on the beach, I want to use it as rental property occasionally. I have spent two years in looking and reading about Ecuador, and the problem is that I don’t speak Spanish yet! I like your choice of Manta. It would be my personal choice for full-time living on Ecuador’s coast, perhaps followed by nearby Bahía de Caráquez. See what you think after visiting Salinas. For a rental property, Salinas, Playas, and Atacames will probably be your top markets, while Manta is the most substantial city offering the full-time expat the widest range of city amenities, including an airport. My advice would be to make sure you’re happy with the lifestyle first and to worry about the rental opportunities afterwards. I don’t know if Americans are driving the prices up in Manta, but I have seen American realtors driving the prices up. I looked at one apartment in Manta with an American realtor and the local, Spanish-speaking realtor (who had the listing). The local realtor gave the price at $130,000, while the American realtor raised it to $150,000…one more reason to study Spanish. If you’re moving in two years, you could be fairly fluent by then if you work at it. It will greatly enhance your lifestyle and could save you a lot of money. How could I buy an apartment in Uruguay, and rent it out, without being there? Do you know of a trustworthy management company? Also, what are the properties going for in Uruguay? I am forwarding your letter to my friends, and we all find it very interesting. I would not attempt to buy a property from abroad, but you could certainly manage a rental in Uruguay from afar. Tourism is a huge contributor to the Uruguayan economy, which earns more tourist dollars per capita than any other country in Latin America. Consequently, they have a mature and professional rental management sector. To get a good overview of what properties cost in the major markets, have a look at Uruguay’s version of a multiple listing service, BuscandoCasa.com ( http://www.buscandocasa.com/ ). This excellent site allows you to filter by all of Uruguay’s major markets and property types. If you speak fluent Spanish, your choices are limitless for property management. If you’d prefer English, I like to work with Reynolds Properties ( http://www.uruguay-real-estate.com/ ) in Montevideo, Alberto Prandi ( http://www.albertoprandi.com/ ) in Punta del Este and Rocha, and Toribio Achával ( http://www.toribioachaval.com.uy ) in Colonia.